Learmonth and Tabakoff outline the physical and neurological changes that typically affect the victims of disaster. Then, using true stories from history as case studies, they investigate the scenario famously imagined by William Golding in Lord of the Flies and borne out by the extraordinary Robbers Cave experiments of the 1950s. As this fascinating book unfolds the awful truth becomes clear. In extremity, humans are capable of a descent into murderous savagery so swift and complete it could—literally—take your breath away. There is something irresistibly compelling in the darkest stories of human behaviour, something necessary about facing the worst we are capable of, no matter how savage. Using William Golding's classic, The Lord of the Flies, in which a utopia soon turns dystopic, this fascinating study of human nature poses the question: what happens in real life scenarios of extremes? Does humanity degenerate into social implosion as Golding would have us believe? How does the process begin and what causes survivors to abandon altruism in favour of ruthlessness? Bringing together historical examples of terrible shipwrecks and other calamities, the authors analyse each case in the light of current psychology. 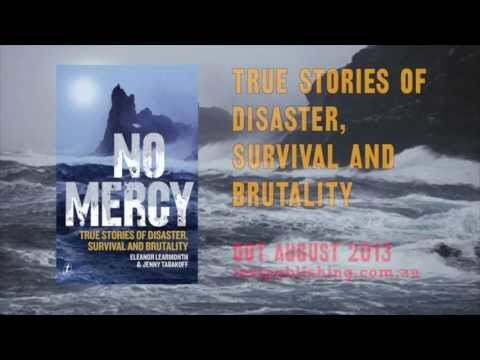 Well researched and well argued, lively and energetic, No Mercy is full of insights into leadership, loyalty, sacrifice and compassion that will challenge readers to wonder what they might do if similarly tested. Some younger folk will find it disturbing. It makes for very interesting conversations. This book is a stunning read. I hadn't read Lord of The Flies in over 30 years but its message has always stayed with me. Reading No Mercy brought all this back and it is a very telling look at all that is wrong - and right - with humanity. I'm passing this onto my teenage children to read. Not only is it beautifully written it is also compendium of tales we should never forget. Great read! Despite the subjects, it doesn't make you feel squeamish as it is tastefully written. Each chapter is just the right length, neither too long nor too short, giving space to breathe before you move on to next. Wonderful mixture of historical events and psychological thriller! Beautifully written, and the most powerful non-fiction book I've read in a long while. Collating the survival stories as done so in this book offers such fantastic insight into the human condition when we're pushed to our absolute limits. I found it both enthralling and profound. Exploration of humanity and how we react in crisis situations. History, biology and sociology analysed in real life examples of how people cope or don't cope in disasters. Easy to get into and difficult to put down.